Despite missing half the season with a concussion, he is honored for 14th year in a row. LAS VEGAS – Dale Earnhardt Jr. was named NASCAR’s most popular driver for the 14th straight year Friday night, but this year’s honor was anything but routine. Earnhardt missed half of the 36 races after suffering a concussion, and was out of the car for the entire period during which fans could vote for the NMPA Sprint Most Popular Driver Award (Sept. 4-Nov. 20). But Earnhardt still was eligible — it’s open to any driver who had declared for Sprint Cup Series points this season — and his loyal fans made sure he’d keep his record streak alive. 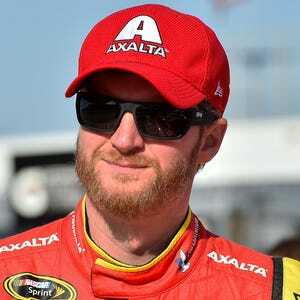 Earnhardt is now just two awards short of tying Bill Elliott’s record total of 16. Earnhardt is planning to make his return to NASCAR starting with Daytona Speedweeks in February, and he suspected his supporters channeled their enthusiasm for his return into another year of strong voting turnout.